Congratulations to Our 2018 Rising Stars! Congratulations to the Dermatology Consultants physicians named 2018 Rising Stars by Minneapolis/St. Paul Magazine! Dr. Bethany Cook, Dr. Jeremy Cook, Dr. Jozef Lazar, Dr. Todd Seelhammer and Dr. Lydia Turnbull all received the honor. 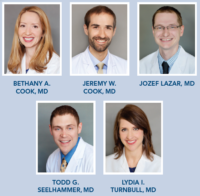 These doctors are considered “ones to watch” in the Twin Cities area and are recognized for their outstanding practice in the field of dermatology.